Use your own images to create a digital photo album! Import your favorite photos from a digital camera or scanner, then add captions, transitions and background music. Save your images as wallpaper. Corporate Send images and text bulletins to your employees via your corporate network, and update them at any time. Includes password protection. - Automatically cycle trough an unlimited number of JPEG, GIF, PNG or BMP images. - Import images from a scanner, digital camera or any TWAIN-compliant device - directly into the program in one step. 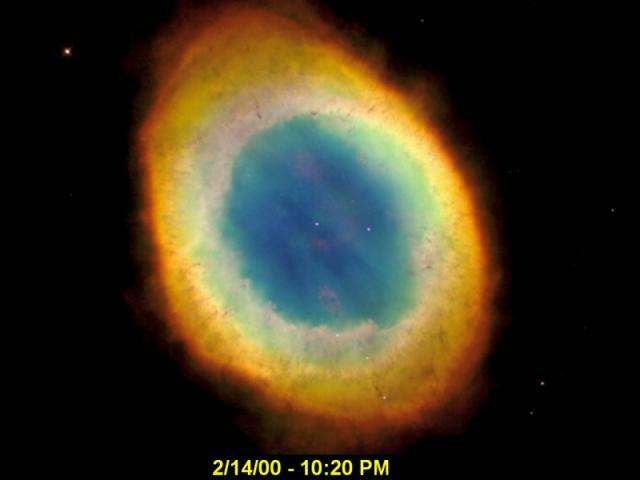 - Image Preview: display a thumbnail preview of the images stored on your hard drive or network. No more guessing filenames when adding photos. - Includes "Drag and Drop" support: select one or several images from a directory, and drag them into your PlayList at once. - Includes sub-directory support when playing from a Directory. Play alphabetically or randomly. - Read images and text messages from a directory on your network, and display bulletins on your employee's screens. - Has built-in network error detection: the screensaver will sense if your network is down, and revert back to displaying the local image list instead. Directory Synchronizing**: reduces LAN traffic by mirroring a copy of the updated images/text files onto the local system. If no changes have been made to the images, no file transfer occurs. ** This feature is intended for Corporate clients only, and is not available in the retail version. Please contact sales@e-motional.com if you are interested in obtaining a corporate version. - Includes user-configurable speed control of scrolling text message. - Corporate clients: e-motional Images Screen Saver can read a text file stored on your LAN server, and send a bulletin to employee's screens at any time. - When the screen saver starts, your music will too. - Play your music CD's too: place a CD in your CD-ROM drive, and the the CD will begin playing when the screen saver starts. Password Protection: protect your system from unauthorized access. Use the standard Windows Screen Saver password, or e-motional Images also provides the option of using your Windows Login or Novell Netware passwords for Win9x/Me. GetRight-compatible: If you use GetRight to download files from the Internet, the e-motional Images Screen Saver will show you which files are downloading and the percentage completed. You don't have to disable your screen saver to keep track of your downloads. Quick-Launch Icon. 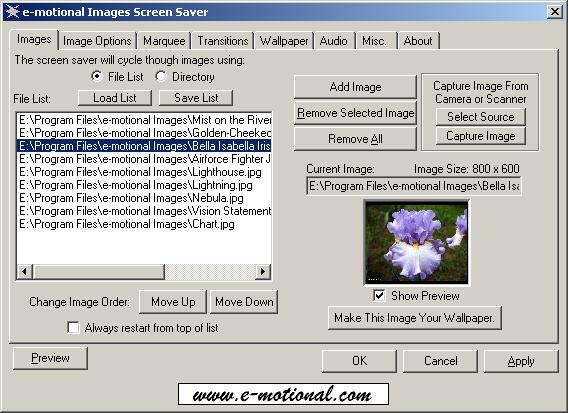 Click on the e-motional Images Screen Saver icon in your Windows tool tray to run the screen saver immediately, or for quick access to the configuration options. 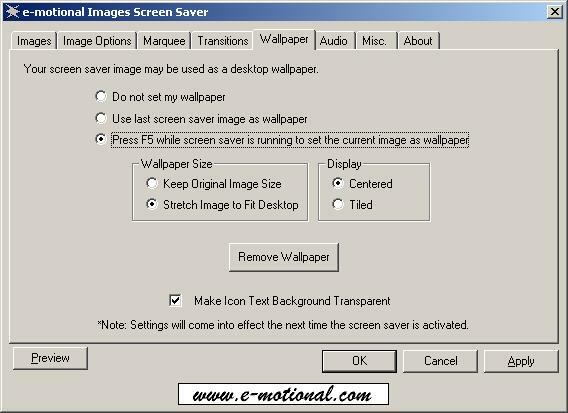 - When no users are logged on to the system, the e-motional Images Screensaver can be set as the default screensaver. - Ideal for users of Win NT, XP or 2000. - Simply run the "Set LoggedOff Screensaver" utility from your Start/Programs/e-motional Images menu. Wallpaper support: Save any image as your desktop wallpaper. - Control the speed of the scrolling text marquee. - Images selected from a directory can be cycled alphabetically or randomly. - Select a "splash screen" for your screen saver that will always be displayed first whenever the screen saver runs. - Corporate Clients: create a custom LAN-based or Internet-enabled Screen Saver to communicate your corporate vision in a novel way. Contact sales@e-motional.com for details. Remote Administration: Active Directory users can fully manage the screensaver using Group Policy. An Administrative Template (Auto Web View.adm) that can read into your group policy editor can be downloaded here. a unique feature developed by e-motional.com software. Enjoy the beauty of your wallpaper images with less desktop clutter. so you can see the wallpaper image better. Create a custom Screen Saver for your business. Send bulletins to your employees, partners or clients. Choose between displaying images or webpages, and add an optional text message that scrolls across the bottom of the screen. Update your bulletins anytime, remotely, using a LAN or an Internet connection. Alternatively, create a "canned" screensaver using a preselected list of images that does not update. Distribute to your clients on CD, or via download directly from your website. Copyright © 1999-2018 Esm Software. All Rights Reserved.